High season is the dry season Dec-Mar. Good value during green season from May to August. Just a quick flight from Atlanta, Miami or Houston, the Canal Zone of Panama features not only one of the world’s finest feats of engineering, but also a king’s ransom of birds and some highly charismatic animals. 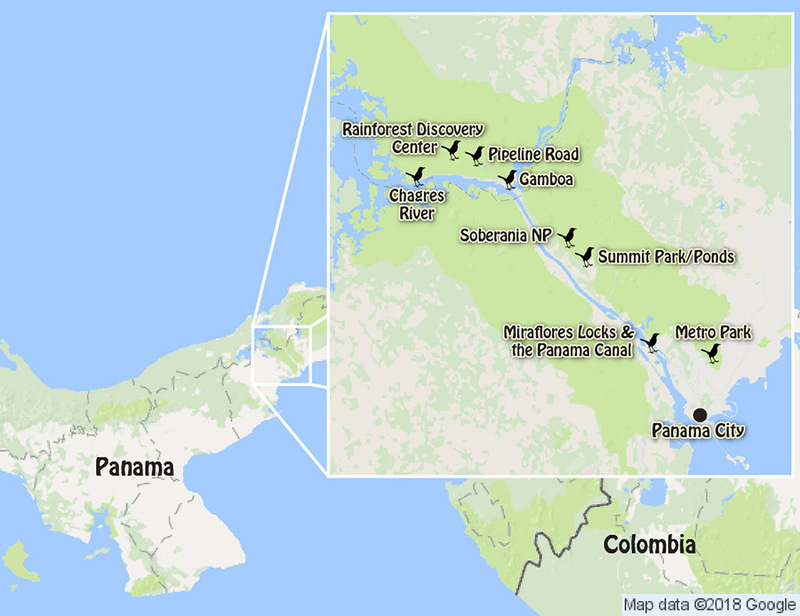 Based right along the Panama Canal, this short, sweet trip offers iconic tropical birds like Keel-billed Toucan, Blue Cotinga and Bat Falcon, and chances for up-close encounters with animals such as the three-toed sloth, Geoffrey’s Tamarin, Howler Monkeys, Night Monkeys, Capybara, and, with luck, even the Rothschild’s Porcupine. The birds are the bread and butter, and we’ll be entertained by a dizzying array of snazzy hummingbirds, and a suite of antbirds, trogons, puffbirds, and motmots, including right at our lodging. And, punctuating the spectacular avian experiences are flashy encounters with some of the fabulous Central American mammals. Whether tracking an antswarm, stalking a troupe of monkeys, communing with a sloth, or gawking at birds, all the sites we visit are close, such that once you arrive in Panama there is little time in transit and lots of time watching wildlife. If you have a great circle of friends, or want to engross your family in an amazing outdoor experience, the birds and wildlife of the Canal Zone have much in store for you. Keel-billed Toucan, Blue Cotinga, Bat Falcon, Whooping & Rufous Motmots, 5 species of trogons, parrots, sometimes large volumes of migrant raptors. Black Howler Monkey, White-nosed Coati, Three-toed and Two-toed Sloths, Geoffrey’s Tamarin, Night Monkey, Tamandua, caimans and crocodiles, with rare mammals such as Ocelot or Rothschild’s Porcupine possible too. Moderate to very comfortable eco-lodge or western style hotels. Great food and nice lodging very convenient to our birding and wildlife outings. Three night drives for mammals, combined with afternoon siestas for unique canal zone experience. Forrest is an outstanding guide. I often have trouble getting on a bird and he was very patient with me. He lived up to all the hype my friend told me. Looking forward to more trips with Rockjumper and especially with Forrest. Forrest is truly a pleasure. His bird-finding skills, both by sight and ear, are phenomenal, but even more striking is his singular personality and people skills. Always enthusiastic. Not only would I travel with Forrest again, I preferentially would select a tour if he was guiding.